The Allison Wonderland: it was kind of a crappy day (pun so intended). So this is what happened this morning all over my comforter. So many ways to start this post. Aahhh, where to begin. First off, sorry for the baby poo shot on your screen. My brother is somewhere gagging and screaming "SUSAN" at the top of his lungs...Sorry brudder. Second, how much do you love Karma for turning my day upside down with this little gem? Guess what today was not at our house? Groundhog's Day. Today was definitely not like every other day and I'm pretty sure Karma is a you-know-what and threw this (actually, rather nicely ejected this from Sam's pampers) my way as a slap in the face to yesterday's blog post. "Oh Susie, life can be so dull sometimes staying home with your beautiful baby. BAM. Poo shot all over you and the bed." I really love my comforter. Actually, I don't love it so much as it's what I already own making it currently the free option over trying to find something else - and something else that would work in our room without a total redo. Comforters are like Lebowski's rug. They tie the whole room together. And maybe we don't have a lavish bedroom, but I like it just fine. And fine starts with that comforter. First things first, I cleaned the baby who, not surprising, had come out pretty ahead on this one. Almost didn't even need to wipe him because really, what actually stayed in the diaper? Then took that picture above and mass texted The Girls to see what their thoughts were. Dania suggested I rub Sam's nose in it to teach him a lesson. Great suggestion but it doesn't solve the massive dump on my comforter. (side bar - is this post going to far? Is this the "every time a bell rings an angel gets its wings" but in our world it's a poop post turning you into a mommy blogger?). I decided to start by grabbing my favorite thing in my whole life right now, after Mr. Baby of course. It's name is Fels-Naptha. It's a bar of soap that's been around for 100 years except nobody actually told me about it until I had Sam, and even then no one actually told me, I just read about written by some (say it with me) Mommy Blogger. Oooh, is this the actual moment I go down the Mommy Blog rabbit hole? First poop then reviewing an item. Yup. This is it. 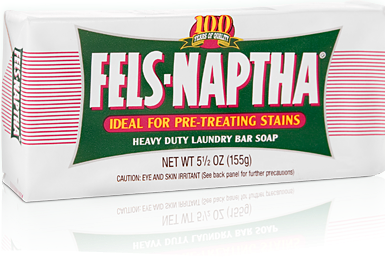 Ok, so Fels-Naptha is amazing. It's just a bar of laundry soap that you rub on stains. It looks like a bar of dial and it costs about as much. It's in the laundry section and is wrapped in paper - super classy. Because of this bar, I have yet to lose a single item to poop, puke, or my general lack of hygiene (like the dress I haven't worn in a year that I hung up dirty with a mystery stain all over the front - clean and perfect again). I used Spray and Wash the other day on a shirt of mine that most of my dinner fell on and had to rewash it with my magic soap because the Spray and Wash didn't cut it. I grabbed the comforter and soaked the "problem area" (is that better?) in the bath tub. Then I rubbed that bar all over it and the fabric against itself and against the bar. I did this a few times, then one final time and let it sit a few minutes (to think about what it had done) which is what the instructions say to do. Clean comforter. Of course, for good measure, we hopped in the car with the wet comforter and headed to Fe's house to use her giant washing machine and an unholy amount of oxy clean to make sure we are really, really, really, clean. Definitely not a day like we've had before, but c'mon - when getting out a poop stain is so fair the highlight of your day week and deserves a blog post, well... my new life. I tell you though - elbows deep in a poop comforter today and it was still the most fun because I had the littlest cleaning assistant in his favorite chair watching me work away. Thank god he's cute. I'm just going to add this all to his bill. Even though it came clean.